Deployment Tool for the bootable Unattended Windows installation! These enterprises already use Almeza MultiSet: Intel, American Transport Group, Mitsubishi Electric, Microchip Technology, Visual Concept Entertainment, Avantek Computer, First State Bank of Altus, Volksbank Offenburg, MVS Incorporated, Rothman Institute, Diaphonics, Bootsystems, Wisecom Computer, EDV-Service Bachmann GmbH, Booysens Computers, Ngee Ann Polytechnic, Ramson and many others companies. We offer a solution for quick and reliable automatic Windows installation together with drivers, service packs, tools and any other applications without losing the current data! We offer a solution for automating your company's IT department. MultiSet is a quick and reliable program for the safe automatic software update throughout all computers in one click! Tired of wasting your time on installing programs? Give MultiSet the job! Among our customers there are banks, government organizations, educational institutions (schools/colleges/universities), research institutions, large and small companies... We have hundreds of users in more than 60 countries of the world. They trust us because our software actually helps you get rid of routine and gives you more time for creative work! As a systems administrator I needed a program to automate my unattended Windows and applications installations to save time. I have tried nearly every macro based script recorder available... but none could do what I needed the most: install an application not based on time, but rather the state of the buttons in the install window. When I found Multiset I was ecstatic! Multiset's recording and playback are exceptional, accurate, and most important, not based on time, so the scripts will work on any computer regardless of speed. But the best thing about Multiset is the support provided by the developers at Almeza. I requested some new features for compatiblity with another program and have been impressed by the speed of their response and their effort to update the program. Results like these from a software company is almost unheard of. They listened and responded with an updated version to make my job even easier. If you work as a system administrator in an organization and maintain a lot of computers, you are sure to have come across the situation when you had to buy a consignment of computers and install all kinds of software on each of them. The direct consequence of such a situation is that you have to repeat a lot of routine operations: change media in optical drives, enter registration data, follow the instructions of installation wizards. Q: What tasks does your program solve? Q: What are the main features of the program? 5) Remote automatic installation. For example, it is possible to automatically install software via the local area network. - Convenient Wizards. Automatic installation disks are created with the help of convenient wizards. - Ease of use. The program does not require any special knowledge (i.e. it has no special script language, complicated settings), everything is as easy as possible. - Processing all installation procedures correctly: restarting the computer during automatic installation, entering registration keys, entering usernames and other parameters; processing nonstandard exception situations in an adequate manner. Q: And what unique features does the program have? A: - Ease of creating an automatic installation disk. Minimum time is required to get the disk ready. - Unique algorithm. The unique algorithm makes automatic installation as fast as possible. - Creating the automatic Windows installation disk and installing service packs, drivers, registry keys and any other software right after that. It is also possible to enable automatic configuration for software and Windows. Q: What benefits do your users get? A: First of all, some statistics. Let's calculate: Windows installation + driver installation + service packs + necessary software + restoring old software settings + general OS configuration - on average, an experienced system administrator spends more than 200 hours a year on all that (25 8-hour business days); a regular user spends more than 90 hours a year (11 8-hour business days). Almeza MultiSet needs not more than 45 minutes to install Windows and necessary software. At the same time, human attendance is not required because installation is fully automatic. All in all, Almeza MultiSet will save more than 20 business days a year for a system administrator and more than 11 days a year for a regular user. Second, Almeza MultiSet creates bootable disks for the automatic installation of Windows and a set of necessary software, drivers, service packs. This disk can be used to reanimate the computer. 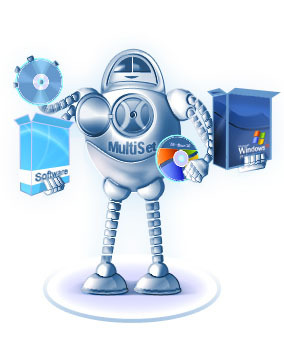 MultiSet is a turnkey solution = insert the disk and the new operating system, drivers, service packs and any other necessary software will be installed on the computer and you can configure the operating system and the software at once. And third, Almeza MultiSet restores the system without losing the current data! Unlike in case of cloning image disks. Q: Who are your customers, what is the target group of your product? - companies possessing a large number of computers. Q: How is the product doing at the moment? A: Currently, thousands of people use Almeza MultiSet in more than 60 countries: the USA, Canada, Russia, the Netherlands, Austria, Argentine, Belgium, Turkey, Great Britain, Hong Kong, Germany, Switzerland, Jordan... The product is being constantly developed and improved, we extensively cooperate with our users and it allows us to know their needs. At the moment we are working on the next version of the program where we will implement new features. It used to take me a couple of days to reinstall programs in my department. Now I quite forgot about manual installation. I insert a disk and here you are. The rest of the job is done by MultiSet! Efficiency Rate - is an enterprise-class time tracking system.